This weekend the R/V Sea Hunter is docked in Portland, Maine. The Sea Hunter is Sub Sea Research’s current research vessel, a 220′ ship that is currently working to bring up the SS Port Nicholson wreck off the coast of Cape Cod, Massachusetts. While the ship is beautiful today, it wasn’t always so pristine. Four years ago, she was a bit of a fixer-upper. 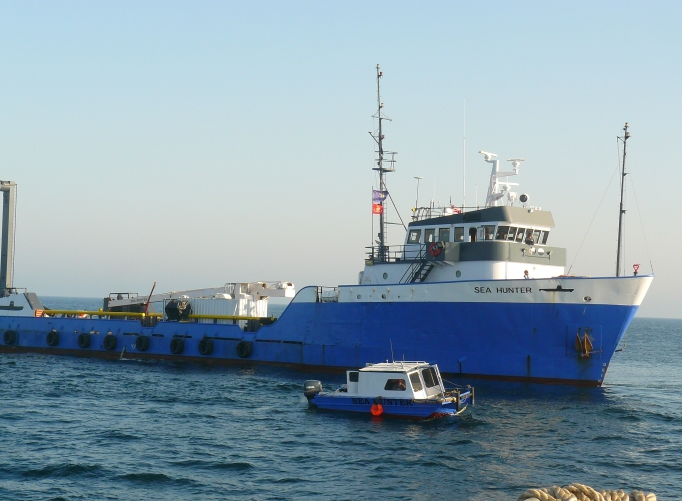 In the fall of 2008, Sub Sea was looking for a larger research vessel to handle more intense salvage missions. Greg Brooks (my dad) sent his chief engineer, Brian Ryder, down to Louisiana to look at three different vessels. My dad joined him soon after and they began to weigh the pros and cons of each ship. 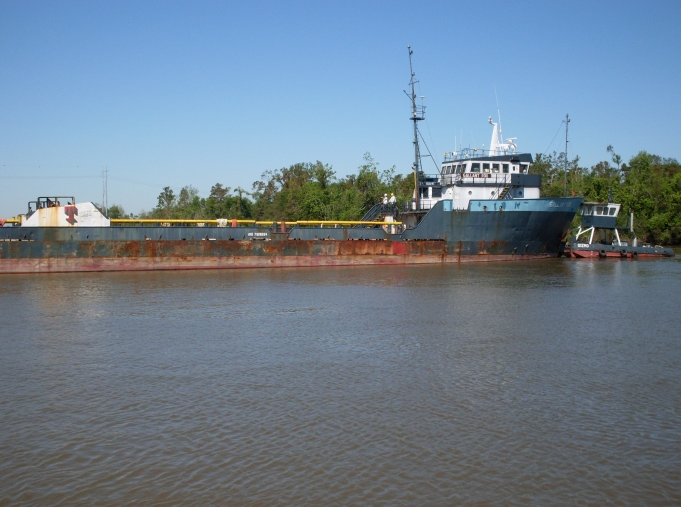 They ended up choosing a ship called the Gallant Fox, which was located near Houma, Louisiana. It was in the best shape of the three vessels Sub Sea looked at. They hauled the ship out and did a survey of it, in order to inspect the engines and hull. Everything seemed sound, though some of the equipment onboard would need to be worked on, and the ship would need to be painted. They purchased the vessel from Quality Shipyards on October 9th, 2008. Everyone was excited since this was the largest vessel Sub Sea or any incarnations of the company had ever owned before. This meant bigger and better things to come for everyone. A couple of weeks later, my dad drove down to Houma with Brian and crew members Matt Johnson and Julia Cote. They arrived in Louisiana on the 26th and moved the ship to the Quality Shipyards site where everyone had a chance to inspect the new vessel. Quality Shipyards was helping with the major reconstruction projects, but the crew had many jobs to keep them busy. They were mostly in charge of cosmetic duties, including (but not limited to) cleaning, scraping and sanding, and painting. My mom, Kathy Brooks, flew down for several days at Halloween. The crew was able to spend the night in New Orleans for the holiday, which was a great time for everyone involved. While there was much work to be done on the ship, the business was still going and the work back in Maine would not stop on account of the ship clean-up project. My dad found he had to juggle the two, and would spend the next few months going back and forth between Maine and Louisiana. On November 7th, he returned for two weeks to attend to business and visit with family. My mom went back down on December 4th to spend her anniversary with my dad, and my father would come back up for Christmas. My mom went down again on January 22nd for a long weekend to help with projects on the ship. There was a lot of back and forth travel that fall and winter, but my parents did what they could to spend time with one another and make their business work. That winter, more crew was brought down to help with the numerous reconstruction projects. Gary Esper, Shawn Jordan, Dave St. Cyr and my aunt Cindy Hart all joined the efforts. With their help, the Gallant Fox was transformed into the newly named Sea Hunter. It took a total of six months to fix up the ship, but the hard work was worth it. On April 30th, 2009, the crew brought the ship up from Louisiana to Maine. They arrived on May 10th at Portland Harbor, where they were greeted by friends, family, and news reporters. This weekend, November 2012, the ship has returned. If you look at the before and after photos, you will see how much work went into getting the ship ready for salvage. She still looks that beautiful today, which goes to show you how hard Sub Sea strives to keep her in the best shape possible.